Last week the Washington Post had some great veggie recipes…this is a modification of one of them the BGR veggie burger. BGR makes a pretty good veggie burger. I modified the recipe because I wanted to make it a tad healthier (quinoa instead of rice and I eliminated the frying step) and I used lentils because I don’t eat black beans. I also halved the recipe…they must make some FAT burgers…because I still got 10 pretty good sized ones (they said serves 12). I also didn’t feel the need to eat this on a bun. The recipe starts with pre-cooking your ingredients. Cook the quinoa (follow the instructions on your package. I boil water and then add it to the quiona and bring it down to a simmer). Cook the lentils (I did 2 cups water to 1 cup lentil over medium heat). My sweet potato and squash were pre cooked–left overs from last week. But you can toss one in the microwave for about 7 minutes (wrap it in a wet paper towel). Put the bbq sauces and molasses into a mixing bowl. Line a pan with parchment and form patties on it. Bake at 400 for about 20 mins. Reduce heat to 375 or 350 and continue baking for another 10-15 mins. You want the patties to be dry to the touch on top, but still be moist (you don’t want to dry them out completely). 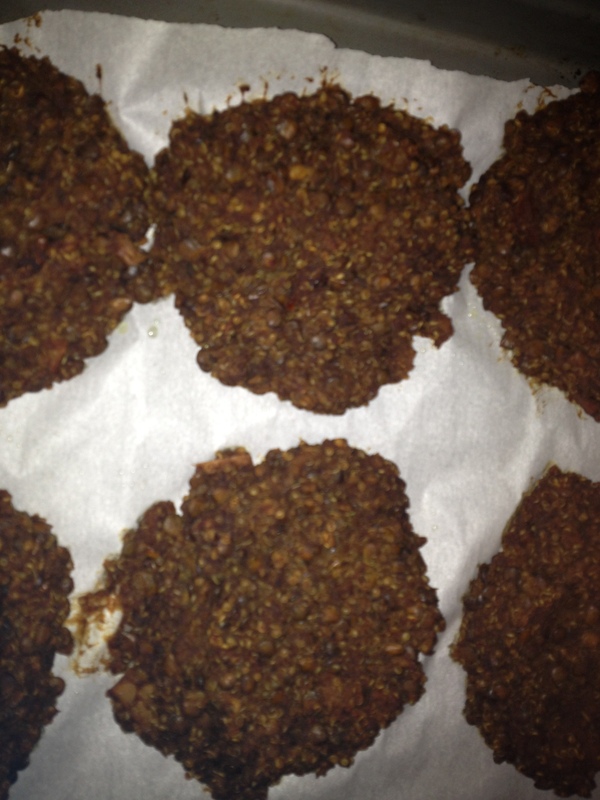 This entry was posted in Recipes and tagged bgr, CSA, healthy, lentils, vegetarian, veggie burger. Bookmark the permalink.